Prime Minister Inaugurate Chenani-Nashri tunnel. 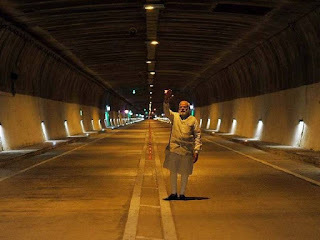 Prime Minister Narendra Modi on Sunday inaugurated the country's longest road tunnel that links Kashmir Valley with Jammu by an all-weather route and reduces the distance by 30 km. The 9-km long ‘Chenani-Nashri Tunnel,' built at the cost of Rs.2,500 crore, was dedicated to the nation by the Prime Minister in Chenani in the presence of Jammu and Kashmir Governor N.N. Vohra and Chief Minister Mehbooba Mufti. "Kashmiri youths have two options: tourism and terrorism. For 40 years terrorism gave you nothing but bloodshed, deaths and destruction. Had you chosen tourism, the benefits today would have been phenomenal," said Mr. Modi after the inauguration. "Want to tell the Kashmiri youth what actually is the power of stones. On one side, youth in Kashmir throwing stone. On other side, people giving their blood and sweat, cutting rocks for Kashmir's development," he added. After the inauguration, Mr. Modi, along with Mr. Vohra and Ms. Mehbooba, travelled in an open jeep through the tunnel for some distance. "Tunnel to bring Kashmir closer to the country"
J&K Chief Minister Minister Mehbooba Mufti welcomed Mr. Modi and said the tunnel would bring Kashmir closer to the country. "The tunnel will not just reduce the physical distance but bring Kashmir closer to the country. The inauguration of tunnels will also help (sic) to join the hearts of the people," she said. She thanked Mr. Modi for his support during the unrest in the State in 2016. "The situation has improved now but lot needs to be done. We have won all wars but our real strength is democracy. We have to help to bring the people out of trouble through agenda of alliance," she added. "The J&K tour operators have a message for you: Kashmir is a safe place for tourists," she further said. The tunnel, bypassing snow-bound upper reaches, will reduce the journey time by two hours and provide a safe, all-weather route to commuters travelling from Jammu and Udhampur to Ramban, Banihal and Srinagar. The estimated value of daily fuel savings will be to the tune of Rs.27 lakh, according to the PMO. The tunnel is equipped with world-class security systems, and is expected to boost tourism and economic activities in the State of Jammu and Kashmir. The Chenani-Nashri Tunnel is a single-tube bi-directional tunnel with a 9.35-metre carriageway and a vertical clearance of 5 metres. There is also a parallel escape tunnel, with ‘Cross Passages' connecting to the main tunnel at intervals of 300 metres. Come end-March and the country's first bus to run on human and animal waste will debut in Kolkata and ferry passengers on the 17.5 km route between Ultadanga and Garia that are 17 kms apart at a nominal fare of R 1 irrespective of the distance covered. As many as 12 buses running on biogas will start plying on 12 routes in the city. Biogas is produced from animal and plant waste and principally consists of methane. It is a non-toxic, colourless and flammable gas that can be used as fuel for vehicles, cooking and generating electricity. Two other routes are Ultadanga--Tollygunge and Ultadanga--Sector V (Salt Lake). Nine other routes are yet to be finalised. Incidentally, the first bus to run on biogas in the UK was launched two years ago. The ones to run in Kolkata can travel 20 km on a kg of biogas that costs Rs 30 only, which explains the extremely low fares. The tank is of 80 kg capacity and, therefore, the vehicle can run 1,600 km on a full tank. Right now the buses are being built in Delhi. These will be 60-seater non-AC vehicles. Tata Motors chassis are being used for the vehicles. The Centre wants to promote the use of this ecofriendly and cheap fuel as it has the potential of becoming an alternative to fossil fuels in some segments. "Biogas is the cheapest fuel. The lowest bus fare from Ultadanga to Garia is Rs 12, but we will bring it down to R 1. We can offer it and still have a margin that is enjoyed by the normal operators using diesel. All other parameters of performance such as vehicle speed will be the same as normal buses," said Jyoti Prakash Das, chairman and managing director of Phoenix. Das is a PhD in botany and has been working on biogas for the past eight years. Phoenix India Research and Development Group is an alternative energy company that has been selected by the union ministry of new and renewable energy for kick starting the use of biogas vehicles in Bengal. The Centre has selected a company to launch the use of this fuel in each state. Once the pilot run is successful, the ministry will plan introduction of this technology on a bigger scale. Apart from issuing route permits, the state transport department doesn't have much to do in this regard yet. Phoenix has set up a biogas plant in Dubrajpur of Birbhum district. Right now it can produce 1,000 kg of the gas which will be transport to Kolkata by tankers. The company has got the permission to set up 100 fuel pumps. The first pump one will come up at Ultadanga. "If a commercial vehicle runs on this fuel, it is also exempted from the ban after 15 years. If a commercial vehicle switches over to biogas, it will also be exempted from the ceiling," said Das. Each bus will cost Phoenix Rs 13 lakh. "The union ministry notification states that commercial vehicles - those are more than 15-year old and are already banned – can continue to ply on roads, if the owners switch the diesel-engines of the vehicles to bio-fuel engines. It means, all the 12 new biogas buses we are manufacturing can run on roads forever," said Das. However, biogas buses can't be fitted with AC machines. Inverstors of Reliance Jio have to wait for returns. Investors banking on Reliance's Rs.2 lakh crore investment in its telecom venture to start yielding returns will now have to wait longer, after Jio announced it was extending its free services offer to its existing Prime and new subscribers until June 30, 2017, analysts said. The move is also likely to have an impact on the margins of its rivals. In March, Morgan Stanley increased RIL's share price target to Rs.1,506 on anticipation that RIL would start generating revenues from its telecommunications venture from April 1, 2017. "April will be the first month for RIL's monetising of its $55 billion capex on both energy and telecoms," Morgan Stanley had said in its research note to its clients. "While telco monetisation starts on April 1, the first key energy project will start ramping up by end-April. These two should improve ROCE by 400 bps by FY20 after five years of decline." The Telecom Commission, the highest decision-making body in the Department of Telecommunications, had in February written to TRAI asking it to review existing tariff rules to ensure financial growth of the sector. The commission had reasoned that promotional offers by a new player were leading to a fall in revenues of other telcos, and hence resulting in a fall in government's earnings. Prashant Singhal, global telecom leader at Ernst & Young, said that Jio's decision to extend the free services until June will affect the sector as a whole. "The revenues of the telcos will continue to be under pressure as Jio [is] extending its free offer," Mr. Singhal told The Hindu. The move may lead Reliance Industries to forgo up to Rs.6,000 crore, analysts said. Jaideep Ghosh, partner - telecom at KPMG said: "Extension of Jio free services will create more stress for the industry. I think they are going by their internal calculations of 100-million-mark. Forgoing Rs.6,000 crore may be big for others but not for RIL as they have a larger game plan. They may recoup the amount after they start charging." When Durdana married for a second time and to a man of her own choosing, her parents threatened to kill her if she tried to see her new husband. They imprisoned her in their home, but she still had her mobile phone and had learned that a helpline for women had been set up. She noted the number and then one day when she was alone in the house, she called. Nayab Hassan, who was on the other end, answered the call from the helpline centre located in the provincial Parliament buildings in the Khyber Pakhtunkhwa Province, where tribal councils still hand over young girls to settle disputes. It became the first Province in Pakistan to set up a hotline for women that feeds directly into the provincial legislature. It's still a small operation. It began March 1 and so far there are only two operators, Ms. Hassan and Mehran Akbar. They take the information from the women and Shandana Naeem, a lawyer, follows up with advice and a network of free legal services. Their calls have averaged one a day so far, and while most have emanated from the provincial capital of Peshawar, several have come from more remote regions, like Durdana's, which was from Swat. One woman, Aneesa, called to say that two years earlier her husband had thrown acid at her, stole her money and jewellery and fled to Saudi Arabia. She had moved in with her parents and now her eyesight was deteriorating from the acid attack; she needed medical assistance but had no money to pay for it. Ms. Naeem said they helped her work through the red tape of getting a health card — the first step to health care. She also said that most of the calls have been over property disputes, where women were being denied their inheritance. The helpline was developed by Meraj Humayun Khan (70), a parliamentarian who has taken on her male colleagues to organise a women's caucus in the provincial Parliament. With the weight of the 22-member caucus behind her, Ms. Khan lobbied for the direct helpline to the legislature. The 22 women in the provincial Parliament are there on quota seats reserved for women. No woman candidate has been able to win a general election seat from there. Ms. Khan says she plans to run on a general seat in the 2018 elections, but she admits even those men who have championed and endorsed her candidacy have been met with scepticism and resistance. Durdana, the caller from Swat. was told to go to the police station and charge her parents with unlawful confinement or tell her husband to go to police to demand he be allowed to see her, said Ms. Naeem, the helpline lawyer. That was March 6. Ms. Naeem has tried repeatedly to telephone Durdana on the number she gave but it is either turned off or rings unanswered. The dilemma, she says, when giving advice is that there is no way to know whether the police, for example, will help the women or hand them back to the family they are fleeing. "We have to get the police, the justice system, the many government departments, on our side, working with us," said Ms. Khan the founder of the helpline. "While all government departments agreed... we now need them to make good on their promises."